Growing demand for cargo planes means the 767 line in Everett will ramp up output by 20 percent, and further increases could be ahead. Boeing already planned higher production of 737s and 787s. Shares closed more than 4 percent higher on Boeing’s raised outlook for 2018 earnings. Seeing a strong recovery in the worldwide cargo-aircraft market after a prolonged slump, Boeing on Wednesday said it plans a 20 percent production increase for the Everett-built 767 freighter jet in 2020. Added to already-planned rate increases for the 787 Dreamliner in Everett next year and for the 737 in Renton this year, the three rate hikes should maintain local assembly-line jobs at Boeing, offsetting the downturn in 777 production through 2020 as that program transitions to the forthcoming 777X model. 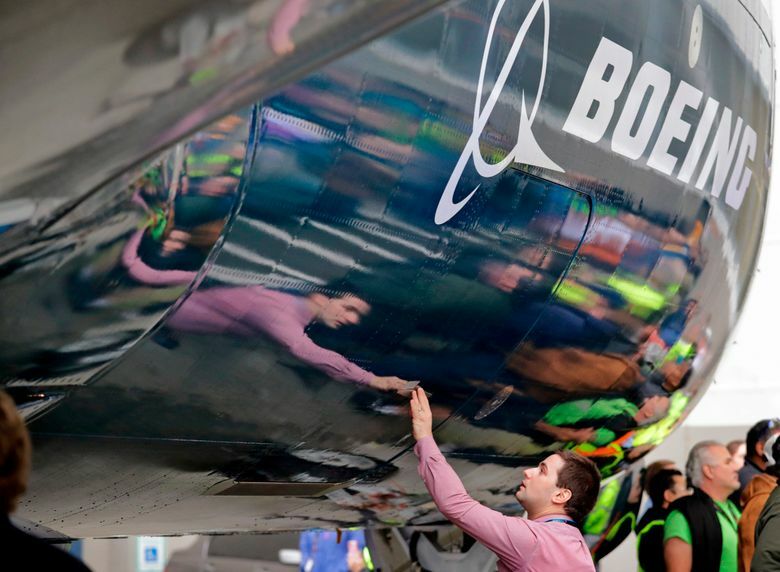 In a teleconference call to discuss Boeing’s strong first-quarter earnings, Chief Executive Dennis Muilenburg offered a bullish business outlook for all the commercial-jet programs. On the defense side, he offered a much rosier picture of the KC-46 tanker program than the Air Force, which now expects delivery of its initial batch of 18 tankers to be delayed until May of 2019. Muilenburg said Boeing expects to deliver all 18 by the end of this year. And he played down fears that the Trump administration could start a damaging trade war, specifically with China, a key market that takes a quarter of all Boeing’s production output. He added that the aerospace industry is important to both countries and said Boeing’s 737 completion center in Zhoushan, China — which will paint and install cabin interiors on 737s destined for the Chinese market — is under construction and should be operational by year-end. Boeing’s Puget Sound-area factories look set to remain very busy even as 777 production dips. Although Spirit AeroSystems stumbled in delivering some 737 fuselages late and CFM International is struggling to deliver LEAP engines for the MAX on time, Muilenburg said Boeing is “on top of the challenges” and has not delayed any deliveries. Muilenburg reiterated the plan to boost 737 production from 47 jets per month now to 52 per month later this year and to 57 per month next year. He also said that demand remains so strong that there’s pressure on Boeing to go even higher. For the 787 Dreamliner, Boeing had a rush of new orders in the first quarter, including 25 by Turkish Airlines, 47 by American Airlines and 10 by Hawaiian. Muilenburg said the 787 program is in much better shape financially now that all the expensive early-build jets have been sold off and the assembly lines are producing more of the higher-margin 787-9 and -10 models. In addition, he said Boeing has reached significant “step-down” pricing agreements with the major 787 suppliers, including Spirit, Leonardo of Italy, and Mitusbishi, Kawasaki and Subaru of Japan. He said Boeing is on track to go from 12 to 14 Dreamliners a month next year. In the first quarter, profits on the 34 Dreamliners built in the quarter lowered by $668 million, or $19.6 million per airplane delivered, the total of past 787 production costs that still have to be recouped. That’s a sharply accelerated reduction in the future cost overhang. Last quarter, Boeing recouped only $16.4 million of deferred costs per airplane. The total of deferred production plus tooling and other nonrecurring 787 costs previously sunk into the program and still to be recovered now stands at $27.7 billion, down from $28.5 billion at the end of 2017. For the 777 program, Boeing has already slowed the delivery rate way down to 3.5 planes per month to create time to build the first 777Xs. The fuselage of the first ground test 777X is currently being assembled. Despite that slowdown, Boeing still hasn’t filled all the delivery positions on the current 777. However, while Muilenburg conceded that “we still have more work to do to fill the remaining 777 production slots” in 2019 and 2020, he doesn’t foresee a need to lower the production rate further. And Muilenburg offered assurance that this outlook won’t be affected if politics prevents Iran from taking the 15 Boeing 777s it has ordered. “The (777) production plan we have in place is not dependent on the Iranian order,” Muilenburg said. Most encouraging is the news of the 767 rate increase from 2.5 to 3 jets per month beginning in 2020. The continued commercial demand for the 767 is entirely in the freighter market, where Boeing currently enjoys a monopoly in mid-size and large cargo aircraft with its 767, 777 and 747 freighter jets. Airbus focuses on passenger planes almost exclusively and offers no competition for any of those Boeing planes. After years of stagnation following the global financial crisis of 2008, the airfreight market finally grew last year at a strong rate of 9 percent and is continuing to boom this year with a growth rate of 7.7 percent through February. FedEx currently has 56 unfilled orders for the freighter version of the 767, UPS has four and another unidentified customer has three. The growth of e-commerce is a big factor in the surging air-cargo market, and Amazon is another potential 767 customer. The tech giant’s Prime Air unit already has a fleet of 40 used 767s but has been negotiating with Boeing about a potential large order of new freighters. Muilenburg was equally bullish about the company’s military aircraft. In particular, sales of Boeing’s F-15 Eagle jet fighter, which first flew in the 1970s, and its F/A-18 Super Hornet, which first flew in 1995, have continued longer than anyone anticipated. In 2017, Qatar ordered up to 36 F-15s. Last quarter, Kuwait bought 28 F/A-18s. And in the Pentagon’s latest five-year future defense plan, the Navy has requested 110 new F/A-18s. “We can now see both the F/A-18 and F-15 production lines (in St. Louis) extending far into the next decade,” he said. Boeing stock closed $13.80, or nearly 4.2 percent, higher Wednesday on the strength of the first-quarter earnings report, in which Boeing raised its projection for 2018 profits by 3 percent. The news overcame recent market jitters caused by the trade-war fears and by separate engine problems that have grounded some 787s and required inspections of many 737s. Beating Wall Street analysts’ expectations, Boeing’s profit in the first quarter rose 30 percent to $2.9 billion, or $4.15 per share, on revenue of $23.4 billion. That’s up from $2.2 billion, or $2.54 per share, on revenue of $22 billion a year earlier. The planemaker delivered 184 commercial jets in the quarter, up from 169 a year ago. The company reported solid profit margins — 11 percent in the commercial-airplane unit and 11.3 percent in the defense division. Boeing raised its guidance on the commercial side’s profit margins to 11.5 percent for the year. After the strong quarterly performance, Boeing raised its guidance for 2018 earnings per share by 50 cents to between $16.40 and $16.60 per share. 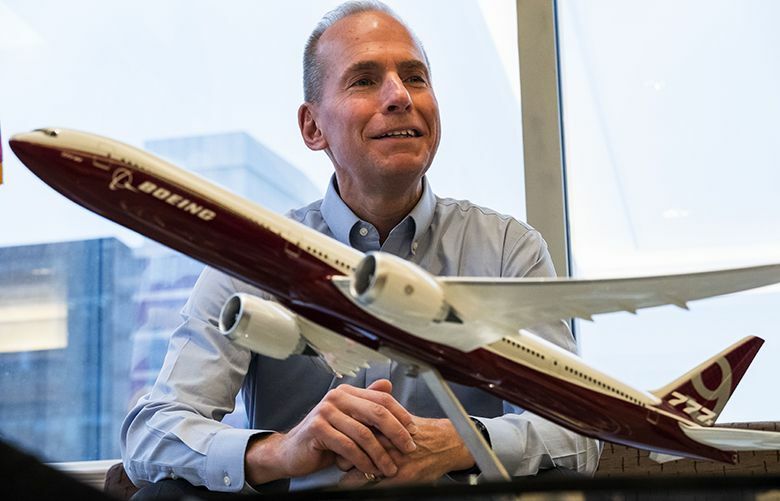 Muilenburg offered no new detail Wednesday on plans to launch Boeing’s next new airplane, referred to as the New Mid-market Airplane (or NMA).